TBI Communications has regularly attended the ALPSP annual conferences for the past ten years. The Conference has always offered a wide-ranging program, expert speakers and provides a friendly forum for everyone in the scholarly publishing community to share information and knowledge, learn about new initiatives and engage in open discussions on the challenges and opportunities in the industry. This year’s ALPSP conference had several sessions that stood out for us, one of which was the address by the keynote speaker Prof. Chris Jackson from Imperial College London. Prof. Jackson’s address titled ‘Adventures in Publishing’, gave a refreshing author perspective on several different topics and challenges in the industry. 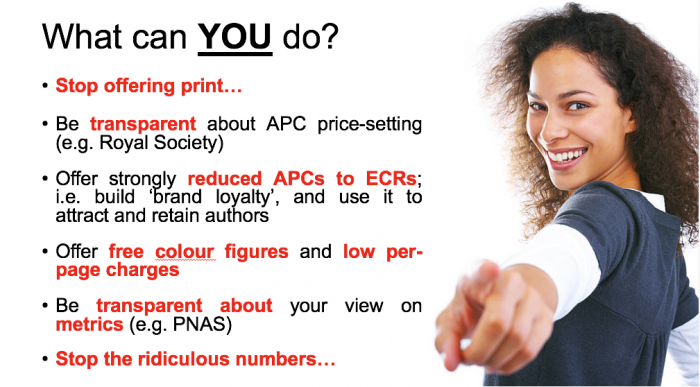 He had a strong message for the attending publishers and societies – which we thought he summarised nicely on this one slide. In particular his point about ‘building brand loyalty, and using it to attract and retain authors’, certainly resonated with us. Many societies and publishers we have worked with recently have recognised the importance of developing author loyalty programs to build brand recognition. The starting point for our work with them is understanding author behaviours, assessing the various challenges they face throughout their career stage – whether that’s securing funding, time management, or making their research discoverable. From this research, we develop messaging recommendations, a detailed plan of marketing activities and content assets to support our author campaigns. One of the other stand-out sessions for us was the ‘Tackling harassment and the roots of gender bias’ plenary session. The talks and Q&A really engaged people. If you would like to find out more about publisher initiatives in educating their staff – in order to manage effectively this sensitive topic, you can listen to this session here. A big shout out to ALPSP for organising this as a plenary session, and recognising its importance. In between the opening and closing sessions, we enjoyed the fun traditional quiz night, plenty of opportunities to socialise with our clients and colleagues in the industry, but certainly, the highlight for us was celebrating the success of one of our clients – Code Ocean winning this year’s ALPSP award for Innovation in Publishing! It was another great conference and we certainly look forward to the next one.